Dr. Nivedita Pandey is a passionate Gastroenterologist, Obesity Specialist and Hepatologist who believes in giving people the care they need without having to go for surgical options. 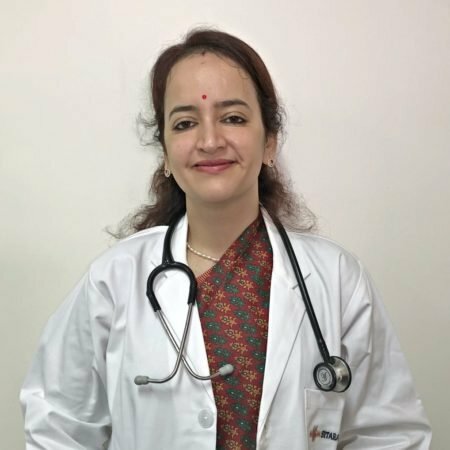 She is also the only female gastroenterologist in South Delhi which makes it possible for women to seek medical help who are embarrassed to go to a male doctor. Degree: MBBS (Bachelor of Medicine/Bachelor of Surgery), Maulana Azad Medical College, Delhi (2005), Resident (Internal Medicine), SUNY Upstate Medical University, New York (2010), Fellow (Gastroenterology), SUNY Upstate Medical University, New York (2013). Pandey N, Parkman H. Pseudo Achalasia after Laparoscopic Adjustable Gastric Banding (LAGB), Abstract Presentation at the American College of Gastroenterology (ACG), 2012. Pandey N, Szyjkowski R. Biomarker Expression in Barrett’s Esophagus Pre and Post Radiofrequency Ablation, Abstract Presentation at the American College of Gastroenterology (ACG), 2012. Pandey N, Kim M. Mucinous Cystadenocarcinoma of the Appendix, Abstract Presentation at the American College of Gastroenterology (ACG), 2014. Pandey N, Glidden M. Probiotic provoked D lactic acidosis, Abstract Presentation at the National meeting of the American College of Physicians (ACP) 2010. Pandey N, Lazzarini A. Epiploic Appendagitis, Abstract Presentation at the American College of Gastroenterology (ACG) 2009. Abstract: Association of military sexual trauma, post-traumatic stress disorder with obesity in female veterans awarded the most “newsworthy” novel abstract by the American College of Gastroenterology (ACG) 2015. Resident teacher award for excellence in clinical teaching: SUNY upstate Medical University 2009. Selected for clinical training program by the American Neurogastroenterology and Motility society (ANMS) 2012. Scholarship-holder: National Scholarship Scheme 1999.